For almost a decade, ScopioneUSA has been an official distributor of Scopione automotive parts and accessories. All products that we carry on this site, are car accessories and automotive parts of a worldwide reputation, for outstanding quality and service. We are committed to ensuring that you will receive quality service and experience. These parts include for automotive makes such as; Aston Martin, BMW, Ducati, Rang Rover, Lamborghini, Ferrari, Lotus, Subaru, Nissan, Porsche & more. Each product that we, at ScopioneUSA.com receive, is automatically checked by our shipping distribution department to ensure quality is preserved . Since each part is custom made, we want to ensure that you receive the part that you are looking for. Each carbon fiber automotive and motorcycle part automatically comes with high quality UV-resistance protection and glossy shine (or flat shine with matte finish). This is to ensure the parts you receive, will last under harsh weather conditions. You can find parts in a wide range of colors and styles without breaking your wallet. 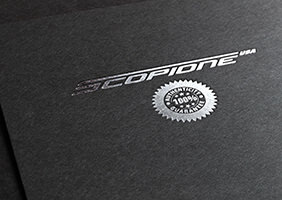 Scopione has developed quite the reputation for providing high quality parts and products that have impressed people around the world. Crafted from carbon fiber, this revolutionary material has already made its way onto the NASCAR circuit where important parts such as the hood are crafted from this material. Carbon fiber is very strong and damage resistant, but also lightweight and versatile. The ScopioneUSA team of professionals has dedicated an enormous amount of time on research and study to ensure that they are up to date with this latest technology. When you call us for the carbon fiber products that you need, we are here to provide you with all the right information. One aspect that many of our customers have noticed is the low, competitive prices. We believe in providing quality products at the best prices possible. This also means that we are committed to providing you with the best customer service. Whether you are contacting us to ask a question, wondering if we have a particular automotive and/or motorcycle part in stock or asking about your order, our goal is to make your experience with our professional, courteous staff as pleasant and informative as possible. We understand that the reputation we have built with our customers is only as good as the last customer we have served. Over the years we have dedicated ourselves to improving our service so that you can get the parts you need hassle free. Let us show you why more people have turned to ScopioneUSA to find what they need in exceptional and luxurious products that are the best on the market. So find out why thousands of people call us their one-stop-shop for high quality Scopione made parts, you will be very glad that you did. For over six years we have brought to the Eastern District of the US the finest Scopione custom parts and products. Our goal is to provide the best parts, at the best prices, with the best customer service. Our team of trained professionals is dedicated to working with you in finding the best Scopione parts and products that fit your needs. We encourage you to check out our online catalog, call our courteous, professional staff and find the best parts that fit your modding needs. ScopioneUSA is the one place you can turn to find the best carbon fiber parts for your next project. We do not just provide high quality customer service, we also check and keep all items in-stock to be ready to ship out. Those carbon fiber automotive and motorcycle products include; kidney grilles, spoilers, mirrors, splitters, eye-lids, diffusers, door pillars, front skirt & lips, plus many more. We offer a money back guarantee on any part that is defective. This is because we inspect every part that arrives at our store to ensure that it is intact, complete, and in perfect condition before sending it out to you. Please give us a try and we promise that you won’t regret it.